One approach for beginning to intermediate level students. This article contains some suggestions on how to practice the piano. These are geared toward pianists from the absolute beginner to intermediate level. This is only one of many approaches to practicing, but all the suggestions are worth applying to your practice routine. First a brief comment. I’ve been teaching music in some shape or form for many years. I can’t tell you how many times someone has come to me to take piano lessons and tells me how they’ve been trying to learn on their own but aren’t getting anywhere. I know there are many online sites – I’m tempted to call them scams – that say you can teach yourself to play the piano, often in a short amount of time, without any help besides their latest and greatest video or online lessons or book or whatever. The truth is, you need a teacher to guide you and make sure you are doing things right. If you’ve tried taking piano lessons from a teacher and not been able to learn anything, I’m afraid the honest truth, even with a terrible teacher, it was probably not the teacher’s fault. There are some people who do not have or do not want to obtain the self-discipline and patience that learning to play the piano requires nor are they willing to do the work necessary to learn. Those people also waste their money on ‘learn to play quickly or learn to play by ear only’ type of scams. Now on to practicing. Adjust the piano bench so you are in the right position – the bench parallel to the piano, centered around middle C and not too far or too close to the piano. Make sure you have enough light to read the music. If using a keyboard, don’t just set it on the bed or a kitchen counter, get a stand that’s at the same height as an acoustic piano and use a standard size (height) bench. Hold your hand, palm up, as though you are trying to hold a small ball in your hand. Note the natural curve. Turn your hand over, keeping that same shape not letting the ball fall, and place each finger (which in the piano world includes your thumb) on a different white key. Your wrist should be level with your fingers. Don’t let the wrist sink below the curved finger heights. Don’t let it rise above the curved finger heights. Your shoulders should be relaxed. Don’t let them push up from their normal standing or sitting positions. The picture shows the extremes, one wrist is a bit high, the other is a bit low and because the fingers are on the black note in the LH, they can’t be as curved as in the RH. Don’t let other things or people in the room distract you. At least for brand new beginners, I recommend that you focus on all the things I’ve mentioned so far before you start to play. As you get ready to play keep thinking about these things at the same time you focus on other things. Do you know the terms and symbols at the start of the piece? Finally, before you start playing, do you know the terms and symbols at the beginning of the music? Is there a 4/4 or 6/8 or 3/4 at the beginning? What does that mean? (Time signature). Are there sharps or flats just before the time signature? What do those mean. What is the tempo? You should know those terms before you play. The composer or arranger put them there for your benefit so you should take advantage of them. As mentioned before, all your fingers should always be on the keyboard (including the thumb) and in a curved position with a level wrist. As you play there may be some movement of the wrists up and down, but at least for a beginner, there should be very little up and down motion. Do you like what you hear? If not, maybe you are playing something wrong. Double check the printed music and make sure you are playing the right notes and rhythm. Sometimes what you play may not sound right to your ears even when you are playing the correct notes. So, before you change something just because it sounds funny, make sure you know why you are changing. Too many beginning and intermediate pianists (and a few professionals I know) want to play a new piece at the speed indicated in the music (the tempo) even when they are not capable of doing so. It always acceptable to play a piece of music slower than is marked when you are learning. This is sometimes essential to learning the music. So, slow down, learn the piece properly. …Or so you’ve probably heard people who play piano tell you. I believe it is acceptable to sometimes look at your fingers, but only sometimes. 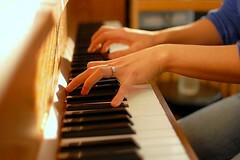 The reality is that music moves by so fast that you don’t have time to read the music and look at your fingers. Being aware of what notes your fingers are on without looking at the keyboard even if you move your hands is a skill you need to learn. Learn the distance between the notes on the music and how that relates to your fingers (the intervals). If you play a note with your second finger and the music goes up one line from the line it is on, the next note is played with the 4th finger. You don’t need to know the note name. Sometimes this is faster than trying to figure out the note, then figure out what finger you need to play it with and then play it. However, you can’t play by intervals alone anymore than a well-rounded pianist can play just by ear. You still need to know what note(s) to start on so you absolutely must learn the names of the lines and spaces in the treble (RH) and bass (LH) clefs. When playing a piece of music, you should keep the tempo steady, almost with a machine like precision, at least to start with. Those vertical lines in the music, the bar lines, do not mean stop, pause or wait. The only thing they are there for is to tell you where one bar (aka measure) ends and another starts. So, don’t stop at the end of a bar. And remember that the first beat after a bar line is always beat one. Are there slurs? Are there staccatos? Are there accents? Those are collectively known as articulations. If so, be sure to observe them. Watch out if one hand has slurs and the other doesn’t. In those situations, it is sometimes easy to make both hands slurred or to forget to do the slurs in one hand. Rhythm is the relationship of the value of the notes to one another. A quarter note should always be the same length throughout the piece of music. A half-note is always twice the length of the quarter and the whole-note is always four times the length of the quarter. This is true throughout the song. You need to count the beats in a measure. The 4/4 at the start of a piece of music tells you there are 4 beats per measure and that a quarter note gets one beat. As you play through a piece of music, count the beats in the measure – keep the counting steady – and play the notes on the beats they are supposed to occur on. The beat should be as steady and consistent as the flow of time is steady and consistent. Time never stops, nor should the beat. Are your fingers curved, wrists level and shoulders relaxed? By the way, are your fingers curved, wrists level, and shoulders relaxed. If not, go back to the beginning and re-read this. The unfortunate truth about becoming a good, well-rounded pianist is that it requires work, dedication, commitment, self-discipline, patience, time and work. Did I say it takes work and time, lots of time? I hope these suggestions help you as you practice the piano. Don’t give up. Keep with it and the rewards will be far more than the effort it took you to get there. Ever wonder what goes on in an arranger’s mind when they go to arrange a piece of music? Well, here’s a video showing some of that process. It also shows off some of the new Sibelius 7 music notation software. See how I take a hymn tune based on a German folk melody and turn it into a fugue like arrangement for solo organ. Not mentioned in the video is that the piece was used a few weeks ago (end of July 2011) as a postlude for a church service. Postludes are the music heard at the end as everyone is leaving so you don’t want it to be too long. The piece served its function well and will probably be used again. I did find one issue with the arrangement when playing it. As the 3rd voice of the ‘fugue’ comes in, the hand spread required to play the piece requires part of the right hand part to be played with the left hand. That’s not too bad, but it was a bit awkward switching. Questions about Sibelius or making the arrangement are welcome. A look at the new Sibelius 7. Keep an eye out on my YouTube page in the near future for some screen shots and more detailed looks. As someone who upgraded from Sibelius 6, this version is taking me a bit of time to get use to the new layout. Some items are harder to find at first. Once you know where they are, it is arguably easier to find the next time you need them. There were few changes of key commands. I’m not sure if convert is the right word, but for those coming from Finale (as I did with version 6), one word: patience. Sibelius approaches tasks from a completely different way than Finale. It is not a task based/tool based approach. It is more what I would call a ‘selection’ based method. Select an item, do something with it, whether it be selecting a staff, typing the N key and entering notes or highlighting a region and pressing CTRL-arrow up to move the notes up an octave. Once you figure out how Sibelius does thing and start thinking that way, you’ll have no problem. The way Sibelius does text I think is more powerful than Finale, but so different that it may create the biggest challenges. Gone are the menus and in is the ‘ribbon.’ If you’ve used Office products from version 2003 on, you’ve used the ribbon at the top. This will cause the biggest dislike among users of previous versions, but if you are new to Sibelius, embrace the ribbon and use it to your advantage. Similar to the menus, there are different tabs that specify different tasks. Organized to help the workflow in a natural way, each tab contains tasks related to that tab. The View tab, for example, gives many options for indicating what items you want to display (eg. handles, hidden items, etc). While the ribbon does take up quite a bit of vertical space, you can minimize the ribbon so that it looks more like menus. My tests with Sibelius 6 & 7 suggest that when the ribbon is minimized, you have just as much vertical space as in Sibelius 6. The text section has had a major re-write. There are now advanced typography functions available. These include line spacing, tracking, angle and text color. You can directly access an individual text item’s property on the text tab of the ribbon. The need for using the properties window (in Sib 6) is not needed. You can also specify that text fit into a fixed size frame. In newly created scores, it now uses a hierarchical system for text. (If you are opening a file from previous version, you’ll have to modify your text styles to take advantage of this). This means that you can specify that a particular text item will be based on another. Lyrics are the obvious example. Set Lyrics verse 1 as you want your lyrics to look. Then set lyrics verses 2 through 4 to be based on verse 1 lyrics. If you change the settings to verse 1, all the other verses will also change. A new text font is included and is treated as the default. It is the Plantin font. If you are familiar with Oxford University Press, this is the font they use. The location of the files related to Sibelius 7 have changed. Since the program is both 32 & 64 bit compatible, some aspects of the program data have changed. The what’s new file explains the changes. Since Sibelius is owned by Avid, it is stored in an Avid folder. A link to the user files location is included in the installation. On windows, it is in the start menu under the Avid folder, Sibelius part. This is where you put things like downloaded plugins and where the program stores manuscripts and house styles you create. The status bar at the bottom is improved. It shows more details about what you have selected. Also on the status bar are options for showing how the music is displayed (spreads) and the panorama option. A zoom fader with + and – buttons is also now available. The quick-start has changed considerably. The new score and recent tabs give thumbnail views of the items to select. Manuscripts are organized by topics. There is a learn tab that gives links to various sorts of help. There is a latest news link that displays items from the Sibelius Blog. (One of my YouTube tutorial videos is even on there as of this date). Some dialogs can now be resized. There is some uniformity on where the ‘ok’ and cancel buttons show. Some dialogs, like the instrument selector have find boxes to help you find what you are after. (I wish they had done a find button with the keyboard shortcuts). The mixer gets a new look. It looks more like a DAW mixer than it did before. There are three different sizes available, each size shows more. It is docked by default to the bottom of the screen. You can also undock the mixer. Press CTRL-P (or use the file tab) to get to the printer options. I find the new look to be easier to work with than the older system. There is also a print preview that is nice. I know many people complained that there was no XML output in Sibelius 6. Well, 7 introduces the ability to export XML. Some note input changes were made. I suspect they were inspired by Finale. Most notable, ‘sticky’ tuplets. Once you start entering a tuplet, you can tell it that everything from that point on is a tuplet until you turn the sticky option off. Similarly, you can add slurs and lines during note input. If you were use to Finale, you can now specify that you pick the pitch prior to picking the duration. Personally, it never made much sense to pick a note value first before picking a pitch. Whatever your opinion, you can choose between the two. I’ve gotten so use to the default Sibelius 6 method that I haven’t even tried the pitch before value option. I eventually will. This is something I find to be handy. If you already have some notes entered, you can select them, press the up and down arrows and they will go up and down in pitch. Diatonically. If you want to go up chromatically, use SHIFT-Page Up or to go down, SHIFT-Page down. (On Macs it is a different default key command). Exporting has an easier look to it. Graphics exporting has some improvements. The big thing for me is that you can now export your music directly to PDF format. Before I had to use either the full version of Acrobat (which I quit updating a few versions back because it is just too expensive) or an alternative. Now it is built in. Plug-ins are now listed by category. That is, depending on which tab you have selected will determine which plug-ins show up. Any plug-ins you might download will be listed in the home tab. A big tip for anyone using the program is to learn the key commands. For example, instead of going to the file menu, then open to open an existing file, use the keystroke combination CTRL-O (letter O). The nice thing with Sibelius is that you can add your own key commands and even change existing ones. They are in the preferences. If you import a keyboard shortcut set from a previous version, any shortcuts unique to version 7 will not be there. (Like the Shift-Page up/down mentioned above). I would suggest starting from the default 7 menu set and adding your own or changing the existing items. Alternatively, you could go through the what’s new and reference help to see what new keyboard commands have been added or changed and go from there. Use CTRL-+ and CTRL– (minus key) to zoom in/out without having to use the slider at the bottom. Use the inspector to see some of the finer detail about items. This replaces the properties window. If using the new Organ sounds in 7, explore the playback dictionary to find out how to access the various stops included. The dictionary is also useful to look at for other playback features as well. If you have a lot of customized items, create your own house style and/or manuscript papers. Use them when starting new documents. If you can’t stand the purple background, no sweat, go to preference and change the texture to whatever you want. You want change all of that purple, but it does seem to tame down the purple.